Henry (Hank) Millstein is a Northern California based “peace and labor activist.” He’s a a member of the National Writers Union, is a practicing Roman Catholic and serves on the National Committee and the Religion Commission of the Communist Party USA. Millstein also holds a senior post in one of the country’s leading Islamic propaganda organizations. ING’s Islamic Speakers Bureau sends speakers into schools, colleges, community centers and other venues in the San Francisco Bay Area to deliver presentations on Islamic perspectives on a variety of issues, including how Islam is lived out by American Muslims, the place of women in Islam, Muslim contributions to civilization and the history of Muslims in the U.S. Audience surveys conducted before and after ING presentations show that after a presentation, the number of students believing that Islam promotes peace rises by almost a third, while the number of those believing that the religion promotes terrorism falls by two-thirds. The number of those believing that Islam oppresses women falls by nearly two-thirds. ING also partners with several similar organizations operating in Washington, Arizona, Colorado, Texas, Tennessee, Kentucky, Alabama, Michigan, Nebraska, Illinois, Missouri, New York, New Jersey, Delaware and Alberta, Canada. ING works closely with the Muslim Brotherhood affiliated Council on American Islamic Relations. We’ll be discussing the current landscape of hate crimes and Islamophobia. With anti-Muslim advertisements running on buses in San Francisco and the tragic killings in Chapel Hill, understanding what is happening and what we can do to push back as individuals and a community is critical. 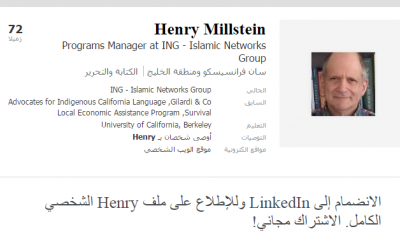 Henry Millstein, as ING Program manager, is intimately involved in this propaganda network. 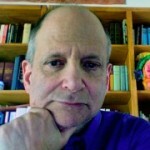 A senior US communist working for an Islamic propaganda network. Two enemies of Western civilization working hand in glove. Communism and radical Islam are allies and have been for decades. Americans need to wake up to this fact – FAST!